If there's one thing 2K's announcement of a shooter-focused XCOM remake has done, it's open the door to a slew of games cashing in on the company's seeming abandonment of the series' turn-based roots. Games like this iPhone title! Much like Xenonauts, which we saw last week, Isochron is a game that sets out to give die-hard fans of the original series something the upcoming Xbox 360 & PC title does not: turn-based strategy. 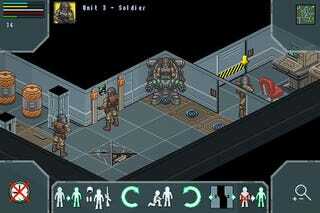 Described as "tactical warfare for your iPhone", Isochron isn't quite as ambitious as Xenonauts, in that instead of trying to freshen up the X-Com experience a little, it's more intent on sticking as close to the original as it can without attracting the attention of lawyers. As with most iPod titles, a release window is a hard thing to pin down, but hopefully the extra attention these kind of games are getting in the wake of last week's big reveal mean it's out before the end of the year.